I installed a casement window a year ago with a built in retractable insect screen (pull down type). The tracks were kind of sticky and when I pulled too hard, the screen sheared off straight along the edge of the spine. Now I need to find a spline that can match the profile of the existing one. Note the screen is sandwiched between the two flaps of the spline and heat welded. 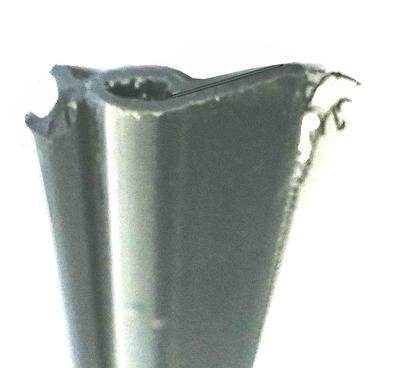 If I can find a replacement spline (in medium soft plastic), I think I can glue the screen into it. 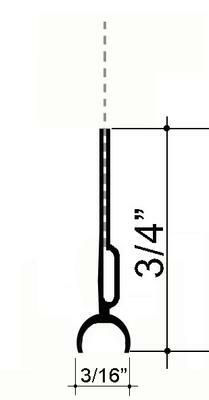 Where can I find a spline like this? I hope it is not European. The window was made by a company in Quebec, Canada. Thanks for taking the time to include pictures. Enfortunately the companies that make these screens dont make spare parts available. The trick is going to be finding a metal bar which will fit inside the tracks. I am thinking that a piece of aluminum flashing folded 180 degrees so that there is a slot to hold the screen would work.